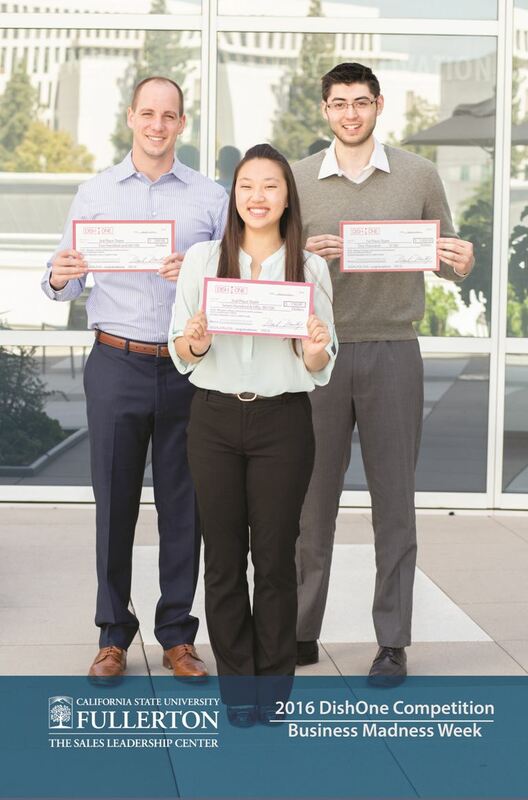 DishOne Sales Competition winners, from left, third-place Antonio Dominguez ’16, second-place Julia Chae ’19 and first-place Alex Leduc ’16. A highlight of this year’s Business Madness Week was the DishOne Sales Competition, which gave students the opportunity to pitch their sales skills before two industry professionals while competing for scholarships. The DishOne Sales Competition, part of this year’s Business Madness Week, involved five-minute sales pitches to two DishOne executives. Contestants played the role of sales representatives canvassing a residential neighborhood trying to convince people to switch to DishOne from DIRECTV. The top three winners received scholarship awards of $1,000, $750 and $500. Julia Chae ’19 (management), who took home $750 as the second-place winner, believes that participating opened her eyes to her sales abilities. “It was fun and a great way to experience something that I didn’t think I would enjoy at all or be good at,” she said. “It was definitely eye opening and pushed me to open myself to things I normally wouldn’t do.” Antonio Dominguez ’16 (marketing) finished third, winning $500. Not too shabby! “All of our sales competitions are great opportunities for students to step outside their comfort zones in a non-threatening environment,” says Mark Mantey, co-director of Mihaylo’s Sales Leadership Center. For more on the center, which offers training, competitions and networking opportunities for Mihaylo students, visit them online or on campus at SGMH 5357B on Tuesdays, Wednesdays or Thursdays from 8 a.m. to 3 p.m. This is an excellent opportunity for students to develop the essential skills in business whether they will work as a sales professional or not. As a Director, Talent Acquisition, I need to use a sales/marketing approach in attracting top talent.